Host your next elegant soiree or a casual private dinner in Tucson, AZ with GRINGO grill + cantina. 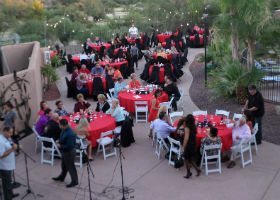 A gorgeous mountain view will serve as a backdrop for your event while your guests dine on classic Sonoran cuisine. Whether you are hosting your event indoors or outside you will find the perfect combination of savory entreés and crafty cocktails for your guests. Up to 125 party goers can join you in a celebration at GRINGO grill + cantina. Whether your guests are relaxing in the Santa Fe Salon or partying on the adjacent patio they will be able to spread out and have a great time with anywhere between 1,500 and 5,000 square feet of comfortable and stylish event space. Whether you are meeting up for a work event, hosting a sophisticated dinner, or meeting up for a family reunion you will be enamored by the unique and unmatched style of GRINGO grill + cantina. For events on Saturday evenings, your guests can also enjoy the rhythm of live Latin music from 6 pm to 8 pm.